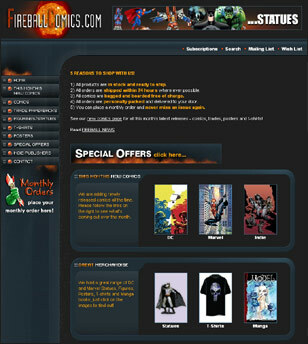 Fireball Comics is a start-up comic retailer which since it's launch online, at the tail end of 2005, now enjoys a healthy market share of the online comic retail sector. The objective was to deliver a vibrant, glossy yet intuitive ecommerce website. The chosen implementation had to fulfill the expectations of a standard shopping cart yet fulfill the expectations and layout of a high street comic shop.